Cleaner Emission Diesel Engines: The B50 series diesel engines are built for greater power with cleaner emissions. 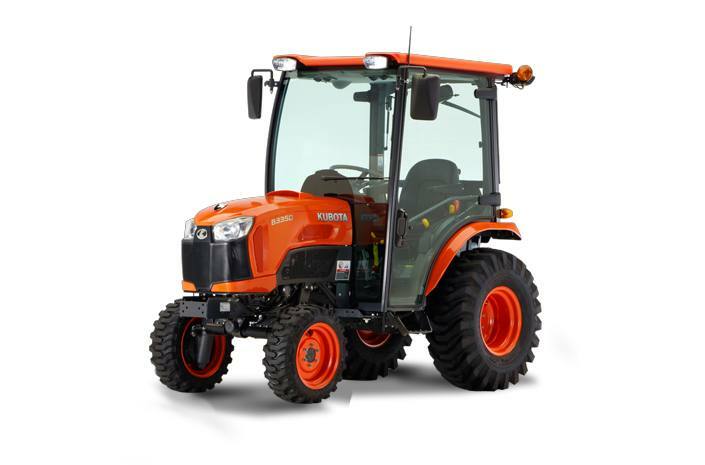 The B3350's liquid-cooled E-TVCS (Emissions - Three Vortex Combustion System) engine delivers increased power and high torque for all the tractor strength you need, while significantly lowering emissions. The Diesel Particulate Filter (DPF) Muffler reduces emissions to make it compliant with the latest Tier 4 Final emission regulation. 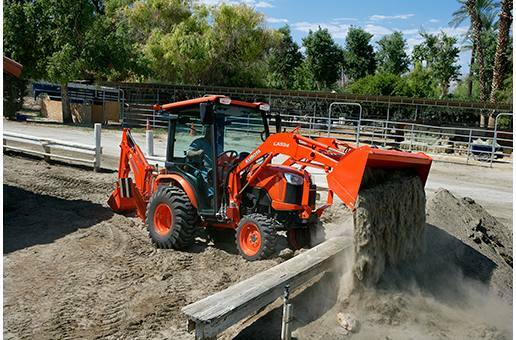 New Integrated Cab Design: The B50 series is the first tractor in its class to employ an integrated cab. The cab and overfenders are integrally welded to the body's sheet metal parts which allows for a 4-pillar construction with rounded glass that delivers more cab space and a wider field of view. The integrated design also eliminates holes in the floor for the pedals for an environment that minimizes noise and unwanted dust from entering the cab for greater comfort. Spacious Quiet Cab: The B50 series brings maximum comfort to the operator thanks to the new integrated cab. The 4-pilar design with rounded glass offers more space and panoramic views of your surroundings. Doors open wide for easier entry into and exit from the cab. Comfort is also enhanced through better noise insulation for a quieter interior. The interior includes a storage compartment, cup holder, a pocket for an operator's manual and tool box, all within arm's reach. Dust-resistant Cab: Keep your cab clean and almost dust-free even after long hours of work. The new integrated cab moves the pedal connections from the floor to to the steering column to eliminate any holes in floor. The cab is constructed to minimize unwanted dust from entering inside. Deluxe Suspension Seat: The new suspension seat is specially designed to absorb shock reducing operator fatigue to make your ride comfortable even under extremely harsh conditions. Arm rests are standard equipment for added comfort. 12V Socket & Storage Compartment: Charge your cell phone or electronic devices with the 12-volt socket next to the storage compartment. Place your device in the storage compartment above the LCD panel, making it readily accessible. Air Conditioner: With the rounded cab and strategically placed air vents that optimize air circulation. The air conditioner keeps you cooler on hot days and the heater keeps warmer on cold days for year-round environment comfort. Loader Lever: The loader joystick and valve are integrated with the control console and standard equipment on the B50 series. 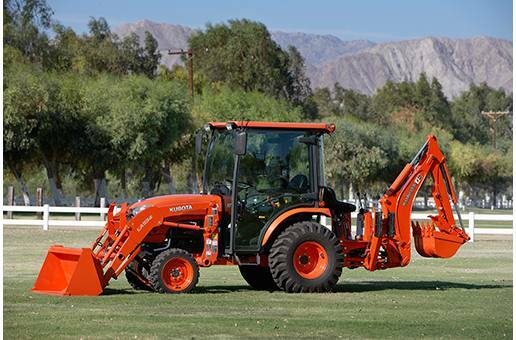 It does not have to be retrofitted when mounting the loader, providing a cleaner look. User friendly Control Layout: For easier access and smoother operation, the levers are logically arranged on the left and right consoles and switches are concentrated around the instrument panel. 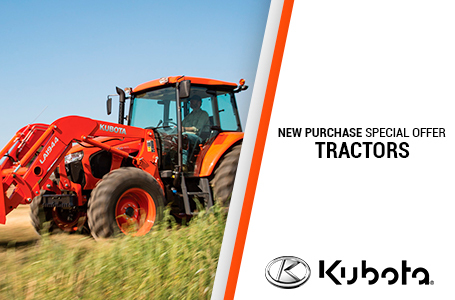 Cruise Control: Kubota's new multi-stage notch-type cruise control keeps your working speed constant. HST Pedal: For easier operation of the HST pedal and more right-side foot space, the brake pedal has been moved to the left side of the steering column. One-piece Hood: For the easier opening and closing and more convenient access to the engine. Fuel Tank Filler: The fuel tank filler has been shifted from the center to the right side of the hood to make filling easier. Rear Window Vent: The cleverly designed rear window hatch lock opens just enough for fresh air ventilation while minimizing grass, hay and dust particles from entering the cab. It is also convenient when you need to talk or listen to people from inside the cab when the doors are closed. Travel Speed: Move from location quicker. The B3350's engine gross horsepower has been increased to 33 HP for a higher forward traveling speed of 14.3mph*, while providing lower emissions at the same time. *When equipped with turf tiers. Hydraulic Control Systems: The position control valve provides easier 3-point hitch control with adjustments in smaller increments which are often required when attaching/detaching implements or when performing sensitive jobs. 3-Point Hitch: With the capable PTO horsepower, the Powerful Category I 3-point hitch and the standard equipped telescoping lower links make hooking up and working with large implements, such as a rotary cutter, box blade and finishing mower, easier. Washer Fluid Tank: The washer fluid tank has been moved to the outside of the cab to make checking the fluid levels and refilling much easier. Rear Wiper & Defogger: The standard equipped rear wiper and defogger enhance rear visibility when needed.